The Red Mile presented a 14-race card on Sunday (September 11), with eight of the contests worth a cool $2 million, producing the Bluegrass State’s newest Sire Stakes champions. In the $250,000 2-year-old pacing colt and gelding final, prohibitive favorite Bolt The Duer paced home in 1:52.1 for Mike Lachance to become the third foal (along with Blue Claw and Shanghai Lil) from his late dam, Wonderbolt, to become a Kentucky Sire Stakes champion. 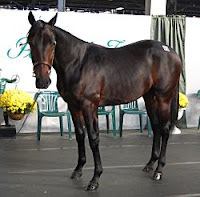 The son of Ponder, who is owned by All Star Racing and conditioned by Peter Foley, boosted his record to 6-5-0-0 and increased his bankroll to $284,000. The Red Mile will host one of the biggest annual nights in Kentucky harness racing on Sunday (September 11), as eight Kentucky Sires Stakes finals will be contested worth a quarter of a million dollars each. 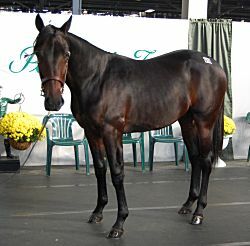 at the 2010 Standardbred Horse Sale. The first of eight $250,000 Kentucky Sires Stakes finals will feature a field of six 2-year-old colt pacers and a heavy favorite in the sensational Bolt The Duer (Mike Lachance). Bolt The Duer is a son of Ponder, out of the late Artsplace mare Wonderbolt. The Red Mile last week received final approval from the state for more than $25.32 million in tax increment financing for a re development project near downtown Lexington that would include instant racing. The Lexington harness racetrack — just off South Broadway, about a half-mile from the University of Kentucky campus — proposed an 80-acre mixed-used development of apartments, a hotel, retail and restaurant spaces, parking garages and offices. Thursday nights will offer great value for racing fans with a "Dollar/College Night" promotion that will run throughout the entirety of the meet. College students will gain free admission and a free race program with a valid college ID, while everyone will be able to take advantage of $1 draft beer, $1 soft drinks, $1 hot dogs, and $1 admission. The Red Mile was the latest track to join with the USTA Strategic Wagering program by guaranteeing a Pick 4 pool of $5,000 on opening night (Aug. 7) and continued the program’s success as the pool exceeded $7,100.